If you’ve been reading Amanda, and I trust you have as you are reading right now, you know that lately I’ve been rather vocal about the lack of serious adult films. Well, fast forward to this weekend, when I had the choice of movies about a middle-aged woman finding love (Gloria Bell), an unlikely friendship between a civil rights activist and a KKK leader in 1971 North Carolina (Best of Enemies), and a film about the 2008 terrorists attacks in Mumbai (Hotel Mumbai). Talk about a fun Saturday night! 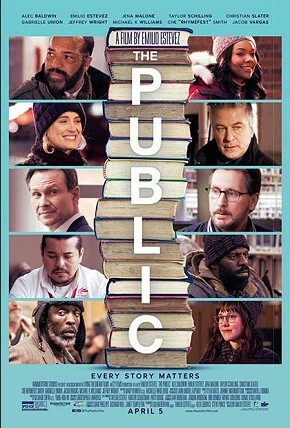 I ended up seeing The Public, a movie about homeless people who take over a public library in Cincinnati to escape the freezing cold. I kind of wanted this movie to be based on a true story but it isn’t. Emilio Estevez wrote, directed and stars as Stuart Goodson, a librarian with a checkered past, who early in the movie finds out his job might be in jeopardy because of an interaction with one of the homeless people who spend their days in the library. He learns about this from Josh Davis, the super snarky and weasley, prosecutor and mayor wannabe, played by the guy everyone kind of wants to smack some sense into, Christian Slater. In a bitter cold winter, the homeless stream into the library every day, washing up in the men’s room, using the computers and yes, reading books (remember them? ), to pass the time, before the library closes and they have to leave. Then one day when the library closes, the homeless decide not to leave. Can you blame them? The shelters are full and their friends on the street are literally freezing to death. Stuart and fellow librarian Myra (Jena Malone), join the cause, but pretty soon this peaceful situation escalates. Davis returns, along with gruff detective and chief negotiator, Bill Ramstead, played by Alec Baldwin, who may I say, is aging quite spectacularly. A TV newswoman (Gabrielle Union), makes things worse by trying to spin the occupation to get her three minutes of national fame. May I digress here just a moment to promote Amanda’s own social cause to stop making journalists the villain. This character is cartoonish and a distraction from the story. The film doesn’t show any other media, and you know there would be plenty on the scene. Bad move, Emilio. What I do like is that Estevez filmed a good deal of the movie inside the actual main branch of the Public Library of Cincinnati. The Public has a very distinct sense of place. And you definitely feel the cold. Estevez gets strong performances from most of his cast. Jeffrey Wright, who is literally always great, works magic in his underwritten role as Stuart’s boss, who is conflicted about the protest going on in his library. But it’s Michael K. Williams as Jackson, the homeless man who plans the protest that impressed me the most. I’ve seen him in many movies and TV shows and he’s just always spot-on. Everyone should know this guy. 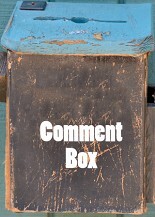 The Public tells a good story, without being too preachy in its attempts to raise our social consciousness. For good measure, it touches on the opioid crisis, hate crimes, addiction, carbon footprints, mental health issues and veterans. It’s a bit distracting, especially a storyline concerning Ramstead’s addicted son that just didn’t quite hook me. Maybe it’s too much, but I’m not going to be the one to complain about Estevez putting social causes out there after seeing nothing but fluff at the movies for a month. I saw The Public on its first Saturday night in Sarasota and there were only about 12 people in the theater. You don’t have to be Amanda Glam to know that this does not bode well for its box office success. Meanwhile Captain Marvel has made what, 450 billion dollars? As long as that keeps happening, my guess is we’ll be seeing fewer independent films on the big screen and more going straight to streaming services. This isn’t necessarily a bad thing as more people will see them, but it means that by the time you read this, The Public may already be gone.